Following the release of the experimental SA1 Index of Household Advantage and Disadvantage (IHAD) by the ABS, AURIN has ingested this data to the AURIN Workbench. In addition, AURIN has added value to this data by aggregating and re-calculating the numbers and percentages at SA1, SA2 and LGA, allowing comparisons to the hundreds of other datasets at these spatial aggregations. IHAD summarises relative socio-economic advantage and disadvantage for households, using the 2016 Census of Population and Housing. These datasets characterise disadvantage at the household rather than area level. This builds on work that the ABS undertook in 2011 where they produced a socio-economic index at the individual level (SEIFI) using 2006 census data. Both indices signify a step change in our understanding of how our socio-economic conditions affect our communities. Now we can understand the conditions faced by households and families, in addition to the socio-economic characteristics of neighbourhoods. This is leading edge research by the ABS and outpaces any other work internationally. 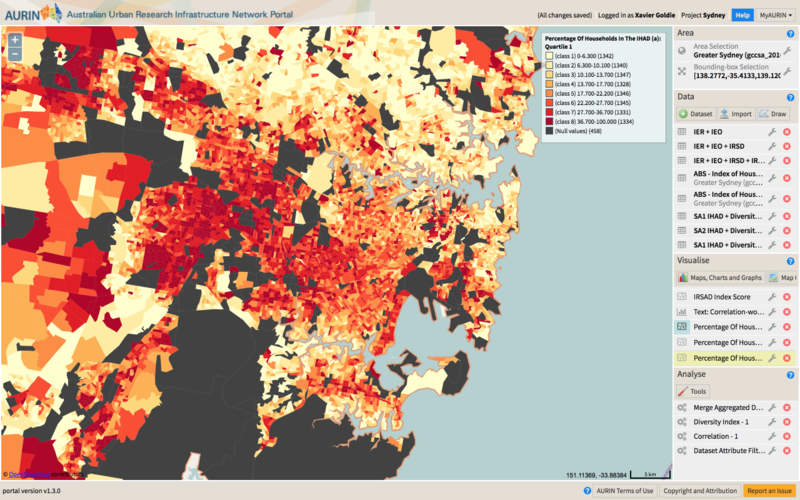 So now we can understand the variance of socio-economic status within neighbourhoods, and understand differences in the lived experience of socio-economic status of Australians living side by side. It supports future planning for service provision, urban renewal and gentrification research, education, health, and social service delivery, at the neighbourhood level. IHAD, SEIFI and SEIFA data are all available through the AURIN Workbench at the finest level of geography available for free and open use by researchers, policy makers and citizens. Currently AURIN has made the 2011 and 2016 SEIFA data available through the AURIN Workbench, and we are in the process of bringing 1981, 1986, 1991, 1996, 2001 and 2006 historical SEIFA datasets to the research community. We also have a range of tutorials designed to equip AURIN Workbench users with the skills and understanding to use these datasets in their own research and investigations.